To mark the re-opening of Woodcock Sports Centre following a £5m refurbishment and renovation, the University of Aston is presenting an illustrated talk on Monday October 17th (6:30-7:30pm) about the centre’s 151-year history. Owned and managed by the University since 1980, when it was purchased from Birmingham City Council for £1, the Grade II listed sports centre in Gosta Green is the home of Birmingham’s oldest surviving swimming pool, dating from 1902. But Woodcock’s history can be traced back almost to the dawn of municipal swimming when, in the 1850s, Birmingham Town Council responded to a public petition calling for the construction of bathing and washing facilities in the town’s northern districts by erecting only the Birmingham’s second set of baths (the first having opened at Kent Street in 1851). 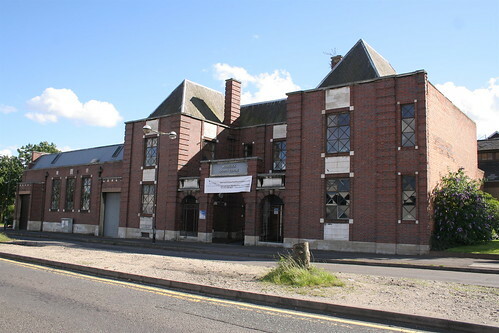 The talk – which is open to the general public and free of charge – will also cover the major rebuilds of 1902 and 1926, when the Gala Pool (now a sports hall) was erected, as well as looking at the 2011 upgrade. Also covered will be Woodcock Street Baths’ rôle as the city’s main municipal laundry, as well as it’s use for winter entertainments such as snooker and boxing tournaments and, perhaps most importantly, for swimming galas, both local, national and international. The refurbishment and renovation has seen a number of original features restored as well as the creation of a new 120-station gym, new martial arts, fitness and dance studios and the refurbishment of both the swimming pool and sports hall. The talk takes place in Room G11 of the main building, Aston Street (entrance via the main reception doors). FoMRB campaigner Steve Beauchampé has penned this article for Woodcock Street Baths’ 150th anniversary. It originally appeared in The Stirrer. Woodcock Street Baths in Gosta Green first opened in August 1860 and there’s been public swimming at the location ever since. Steve Beauchampé reports on the history of Birmingham’s oldest operational swimming pool complex on the occasion of its 150th birthday. Birmingham’s second municipal baths complex, at Woodcock Street in the Gosta Green district of Aston, first opened to the public on August 27th 1860 (the baths at Kent Street having preceded some nine years earlier). Designed by Edmund Holmes of Temple Row – one of eighteen architectural practices to submit designs – the complex cost £12,378 10s 6d and consisted of one Second Class swimming pool measuring an ample 78ft x 34ft 6in, two small plunge baths and 46 private washing (or ‘slipper’) baths, of which 32 were reserved for men and 14 for women. The building itself was functional, with little of the aesthetic flourish that would come to symbolise municipal buildings by the late-Victorian period. As was common practice at the time, there were three public entrances (Men’s First Class, Men’s Second Class and Women’s), class and gender segregation of corporation bathing establishments being the norm. By 1876 the plunge baths had been replaced by a First Class Pool, measuring a modest 38ft x 14ft. In such a densely populated inner city district as Gosta Green was in Victorian Birmingham, with back-to-back housing (most, if not all, of it lacking bathrooms and running water) and a hive of small industries, the public baths inevitably became a vital and essential institution. Some time before 1900 a public laundry was added to Woodcock Street’s inventory of facilities but it would not be until 1902 that the building in its current form began to take shape. The 1860 swimming pool was demolished, replaced with a new First Class Pool, measuring 81ft x 30ft. with 54 poolside glazed brick dressing cubicles and a small viewing gallery at the eastern end which doubled as a bandstand. The work of F.W. Lloyd and built by John Bowen and Sons of Balsall Heath, Woodcock Street’s 1902 extension cost £11,000. In common with other Birmingham public baths (and throughout Britain), the winter months saw at the pool boarded over and used for social events, organised by the city’s Social Institutes Committee. While Woodcock Street staged the more traditional roster of talks, lectures and dances, in 1914 and 1915 the pool hall was converted for use as a rifle range! But it was in 1926, as attendance figures at Birmingham pools reached then record levels, that Woodcock Street Baths was transformed, via a major reconstruction and expansion programme, into what is in essence the building that stands today. Arthur McKewan’s extension included a Gala Pool (100ft x 35ft) with tiered seating for up to 1,100 spectators, a removable six-stage diving platform and demountable dressing boxes. There were an additional seventeen private washing baths, a new public steam laundry, a café, and an impressive entrance hall with marble flooring, oak joinery, white tiled bricks and a domed lantern roof. To facilitate this, all remaining vestiges of the pre-1902 building were demolished, including the landmark ventilation tower. The laundry (used today as a fitness gym) was one of the largest of its kind in Britain, handling towels and linen from each of the city’s bathing establishments. 32,000 towels (measuring 21 miles in length) were washed, sterilized, dried, ironed and folded on a normal summer day. The new Gala Pool was a favoured venue for Amateur Swimming Authority organised international and championship events, including the Bologna Trophy (featuring England, Scotland and Wales). In winter months it was boarded over and hosted events such as boxing, with a spectator capacity (standing and seated) of around 1,900. One of Woodcock Street’s most notable non-swimming events occurred in February 1936 when a session of a snooker match between world champion Joe Davis and the Australian superstar Walter Lindrum attracted a then world record attendance of approximately 1,100. 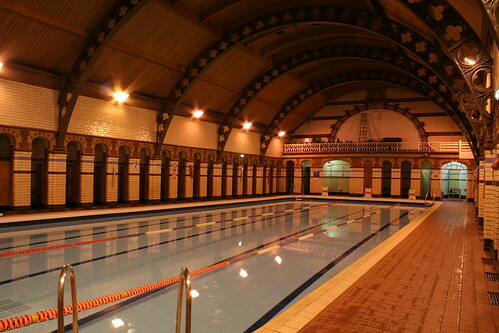 Although substantial modernisation work took place during the winter of 1948/9, by the late 1970s, with Gosta Green’s back-to-backs long since gone and Birmingham’s inner city population dwindled to a fraction of what it had once been, Woodcock Street Baths, like those at Kent Street a couple of years earlier, was considered surplus to municipal requirements. Demolition could easily have been its fate, but then in 1980 the University of Aston, whose campus had grown on the site of all those neighbouring Victorian houses and small industrial premises, stepped in to take over the building. Converting the Gala Pool into a sports hall, the private washing baths into changing rooms, the laundry into a fitness gym and renaming the building Woodcock Sports Centre, the University has – often against the odds – kept the building not just open, but thriving. With public access (i.e. it’s not just the preserve of students) the pool hall of 1902 has remained in daily use and still boasts many of its original features (including the glazed brick poolside cubicles, a feature it shares with only one other British pool – Moseley Road Baths in Balsall Heath). Listed Grade II by English Heritage, Woodcock Sports Centre is soon to undergo a £5m refurbishment programme to ensure the building can continue to serve the students of Aston and citizens of Birmingham for many years to come. There’s even hope that some of the original features lost or just covered over down the years might be re-installed. So Happy 150th Birthday Woodcock Street Baths!